Just taking a moment to welcome in the new month! I was pondering on the bus - there is nothing more precious than a day. Not one wish, jewel, flower or dream is ever more valuable, and nothing goes as quick as a single day. Adult mayflies live their entire lives in the space of twenty four hours. A day is all that we have right now. My board for this month is primarily decked out in pinks and golds - 'a' is a pink kind of letter for me and August is a golden, indian-summer kind of month, especially as by the end of it the leaves are already going gold in the last tired stretch of summer. One - Peter Rabbit books series. I've been trying to incorporate some bedtime reading in to Oscar's night time routine and although he is too young yet to understand the words, we love looking at the watercolour painted characters together and putting on little voices. Two - Lilyflame Fairy dust candle. Lighting candles is slowly becoming an evening tradition again and the soft, powdery fragrance of this candle sounds perfect for those August nights. We must stock up on candles, as where it was once still light at ten o' clock at night, 'tis already dark at eight! Four - Alice Tsum Tsum. All of the tsum tsums I have found are so sweet, especially the little Disney princess faces, it's always so hard to choose between them. I have heard that a greater range is available on ebay, so I might search there to see if they have many new characters. Five - Organix Cherry Blossom Ginseng shampoo. I truly love this range of shampoos and they have made such a difference to the overall health and ends of my hair, it has shine to it now! This 'cherry blossom ginseng' variety sounds gorgeous and I love the look of the packaging and pearlescent bottles. Six - Coffee and Walnut cake has been my birthday cake, year after year! (I am partial to a little tiramisu on occasions) I can't wait to relish it again on the 20th August. Eight - Black Pointed Cut Out Boots, New Look. I might not brave enough to wear heels as high as these but they are so steampunk and victorian; timeless in a way, as I can imagine them suiting jeans as well as long skirts nowadays! On the site they also have a large variety of brogue and ankle boots that look perfect for autumn. 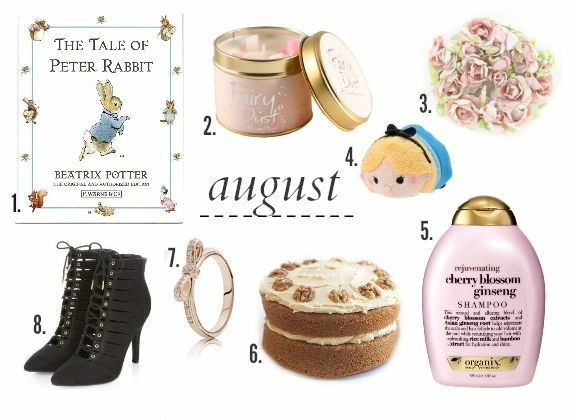 I'd love to know what you associate with August - it a golden kind of month for you? I love that Pandora bow ring, I was actually thinking of getting it! Love this post! Such a unique idea, at the moment all I can associate with august is the impending presence of results day, if I were to make a collage it would proably consist of less pretty pastels and more black ahha! Those shoes are lovely, definitely get them! I love coffee and walnut cake too, although I usually make it with salted caramel as well.